There are plenty of blog posts and books about ways to make money working from home ranging from being a writer or a virtual assistant, or selling on Etsy, etc. 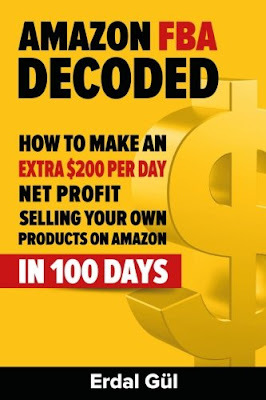 However, if you’re interested in something different, Erdal Gul’s book, Amazon FBA Decoded: How to Make an Extra $200 Per Day Net ProfitSelling Your Own Products on Amazon in 100 Days is a good place to start. 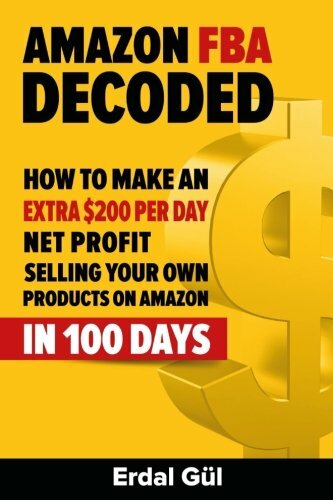 Gul says that in the one year since he learned about Amazon’s FBA program and began selling through it, he has grossed $15,000 a month, of which he nets $6,000 a month. The book contains nine succinct chapters, which are packed full of information. Chapter One: What Is Amazon FBA? Gul begins the book by giving a clear explanation of what the FBA program is as well as the many advantages to it. In Chapter Two, he takes readers step-by-step through the process of setting up a seller’s account in Amazon. Gul is based in Belgium, so international readers will enjoy that he not only explains the process for those living inside the U.S. but for those living outside the U.S. as well. Gul explains that there are products to sell that are restricted (such as health and beauty items) and unrestricted items. For beginners, he suggests selling unrestricted items. These items should be physical items, and they should be in a field you are quite familiar with. He goes on to suggest how to scour Amazon for products to sell. If you have no idea how to find a supplier, this is the chapter for you. Gul explains the best way to find a U.S. supplier or an overseas supplier. That’s not all, though. He also talks about how to compare prices and make sure you find a quality supplier. To be successful on Amazon, you need not only a product to sell, but also brand recognition. Gul gives advice for how to create that. An excellent how-to chapter, this one explains step-by-step how to create the listing as well as compelling copy that will make potential buyers want to purchase your product. One of the most attractive aspects of the FBA program is that you do not have to store the inventory yourself; you can have it directly shipped to Amazon. This chapter explains how to do that as well as how to monitor inventory. There are a number of ways to draw attention to your product besides having friends and family review it. Gul gives many strategies beyond the typical reviews that most people think of first. Forget to account for sales tax, and you’re in trouble. Take Gul’s suggestions to heart to maintain your books properly. Throughout the book, Gul offers Pro Tips such as making sure that you set up your seller account separately from your personal account so you can maintain a professional appearance. The book is full of solid instructions and offers step-by-step advice, so if you’re interested in this line of work, this book would be a good buy ($2.99 as an ebook or $10.72 paperback).